After reading about the Top 15 Over the Top Bloody Marys from Eater.com, I was excited to see that three of the 15 were from Wisconsin (represent!). 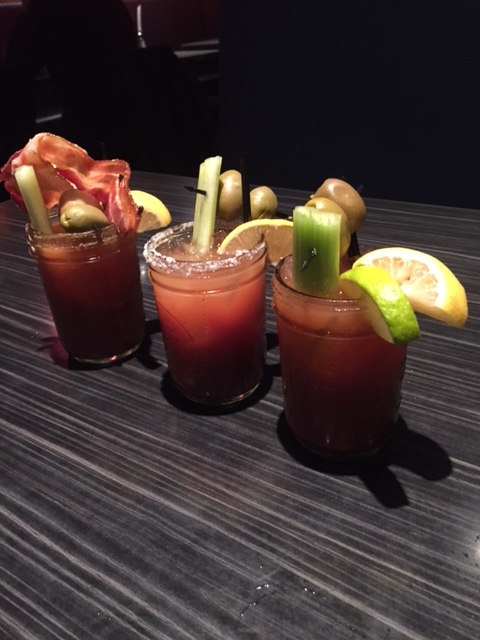 There are four different kinds of Bloody Marys on the menu, including a flight which offers the chance to taste three different Bloodies. Last time I was here, I chose the one with the most fixin’s, which also seemed to be their signature drink: The FAT BOY Bloody Mary, but this time, I tried the flight. From left to right: Fat Boy, Bloody Maria (with Tequila) and Habanero. Spice: Varied by type, obviously. The Bloody Maria had a lot of lime/salt on the rim, so it almost tasted like a tomato-flavored margarita. Mix: They make their own! Fixin’s: olives, lemon and lime across he board, with bacon and cheese in the Fat Boy. Each Bloody Mary was very good, but the Fat Boy was still my favorite. I find it a bit odd that they don’t offer a flight containing a sample of each of their Bloody Marys on the menu. I would have loved the chance to sample the “Tater Tot Casserole” and other fun Bloodies that I didn’t get to yet. Also, set up as is, the only way to get the Habanero Bloody with the jalapeno vodka, is via flight (unless you order off-menu, I suppose). Perplexing, but still delicious. I hope to come back for brunch next time–hopefully sooner than two more years down the road! 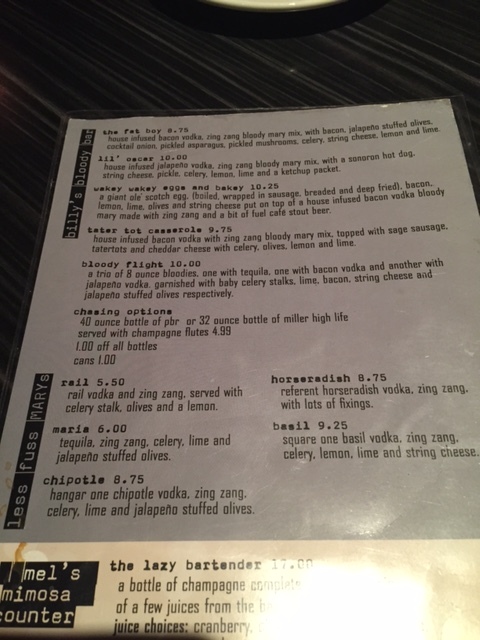 Bluephie’s is one of the Top 10 Best Wisconsin Bloodys listed in my book, The Bloody Trail. The Fat Boy is my favorite as well. Good choice. Cheers!